We are only three weeks away from the CIArb-WIPO-SIAC Intellectual Property, Media & Technology Arbitration Symposium 2014 (“IPMTAS 2014“). 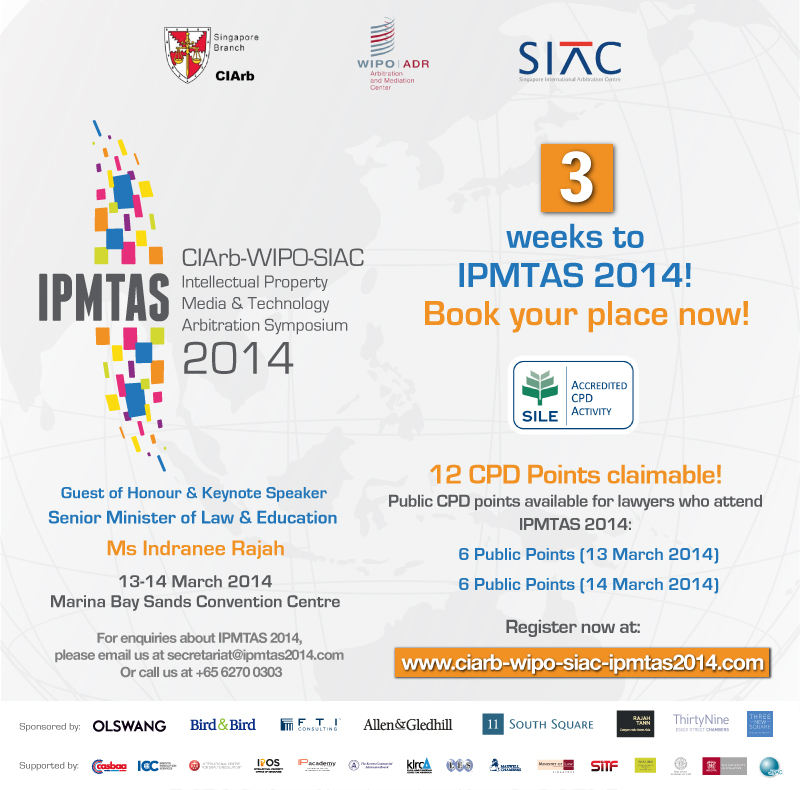 IPMTAS will be held at the Marina Bay Sands Convention Centre on 13-14 March 2014 . Hear the views of leading IP, arbitration and ADR experts and business leaders from around the world in this 2-day symposium as they discuss their experiences and address the key issues, best practices and new solutions. IPMTAS 2014 is ideal for all who are interested in the field of Intellectual Property, Media, Technology and Arbitration, including lawyers, in-house counsel, business leaders and advisers, consultants and experts. Visit www.ciarb-wipo-siac-ipmtas2014.com for more details. For enquiries, please email the event secretariat at secretariat@ipmtas2014.com, or call them at +65 6270 0303.